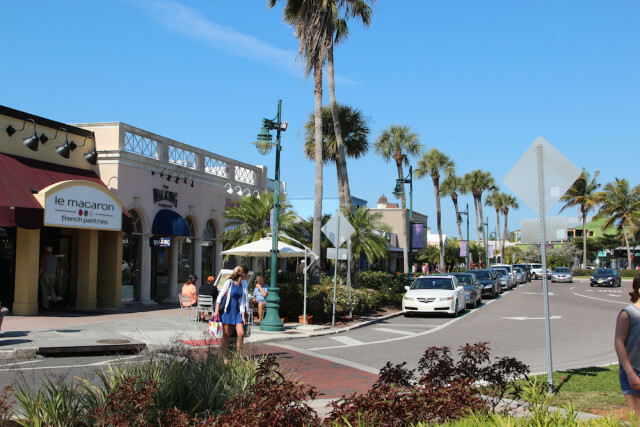 On Wednesday, March 9, the Florida Department of Transportation (FDOT) began posting pedestrian traffic managers on St. Armands Circle to document the effectiveness of controlling pedestrian flow at the crosswalks, the department has announced. The goal is to improve vehicular traffic and help people walk the circle more easily, a news release notes. The uniformed and trained pedestrian traffic managers will stand at curbs of selected crosswalks as they meter pedestrian activity, the release explains. Periodically, they will ask pedestrians not to enter a crosswalk, so they can “create gaps for vehicles to exit the circle freely,” the release adds. After a short time, the pedestrian traffic managers will step out and stop the vehicles so queued pedestrians can enter the crosswalk, the release continues. After pedestrians are safely through the crosswalk, the pedestrian traffic managers will step back onto the curb so they can hold back people on foot once again, the release notes. The pedestrian traffic managers will be on site from 11:30 a.m. to 6:30 p.m. Wednesdays through Sundays through April 3, the release says.